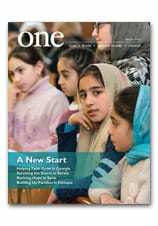 Journalist Dale Gavlak reports on Iraqi Christians finding sanctuary in Jordan in the Spring 2015 issue of ONE — and offers some additional insight below. I began covering the successive waves of refugees descending upon Jordan nearly 12 years ago. At that time, most Iraqis fled their country because the U.S.-led invasion and its turbulent aftermath of sectarian violence made parts of the embattled land — especially the capital, Baghdad — unsafe. Among some of those who arrived in Jordan were Iraqi Christians, whose family members were kidnapped for ransom and sometimes brutally killed or whose neighborhoods and churches were targeted by suicide bombers. Then came the Syrians — who for the most part are Sunni Muslim civilians fleeing terrible violence by both government forces loyal to President Bashar Assad and extremist militants. Most Syrian Christians have escaped to Lebanon, rather than Jordan. Both sets of refugees made the decision to leave their homes and countries due to spiraling, horrific violence and protracted war. The decisions were not made lightly. Many Syrians fled with just the clothes on their backs or carried a couple of plastic bags with their treasured items, thinking and hoping they would soon return home. But with the Iraqi Christians, a different narrative is at play. Somehow, the despair and pain they feel and project seems deeper and rawer. ISIS militants cruelly and brutally forced these original inhabitants of Mosul and the villages of the Ninevah Plain for the past 1,600 years out of their historic Christian heartland. Why should they recant their faith and that of their forefathers or be forced to pay a so-called protection tax? Why should they be run out of town by the sword? These are some of the questions they ponder. An Iraqi Christian in his mid-60’s said it wasn’t just the fact that the extremists took over the businesses he had worked for his entire life. What really galled him was that a militant from Afghanistan was living in his home — a cherished house that had been in his family for generations. The Christians were sometimes betrayed by their Muslim neighbors. The country’s own security forces failed to defend them in their hour of need. Such betrayal is hard to come to grasp and difficult to overcome. Many say that is why — as much as they long to return to their beloved homes and land — they can never go back. How will these refugees work out the Christian tenets of forgiveness and grace to combat the natural tendencies toward despair and bitterness in the face of such great loss? These are the challenges that loom as they ponder what kind of future awaits them and where. One 10-year-old Iraqi girl, named Myriam, however, has made the decision to forgive her ISIS persecutors. TV interviews with Myriam and the brother of two Egyptian laborers beheaded in Libya by the extremists — both voicing forgiveness — have been watched by at least one million viewers in the Arab world and are sparking positive social media comment. Sounds like members of ISIS should tune in. For more, read “Finding Sanctuary in Jordan” in the Spring edition of ONE.